These days, people seem to run off of energy drinks, the Internet and EDM. Back in the 60's, people got jazzed up from peace, love, and funky psychedelic rock. And instead of traveling across the country with your best friends in a van to see your favorite band in concert, today's shows are livecast in high def so everyone can watch them in the comfort of their own home. Oh, how the times have changed! One thing that hasn't changed, though, is what a groovy addition this Deluxe Hippie Peace Sign Necklace makes to your look! 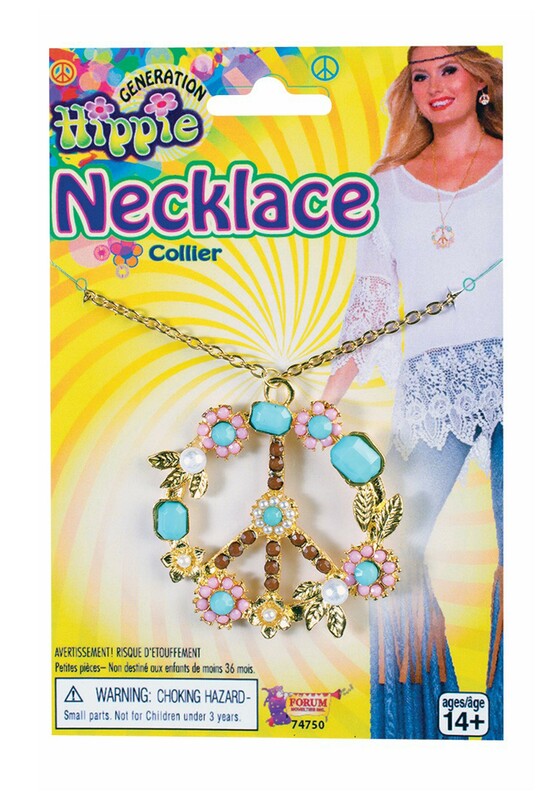 This cute piece of costume jewelry is made up of faux pearls and turquoise (hippies aren't about diamonds and rubies, after all) in the shape of a gold colored peace sign. It shows everyone you run into that even in this fast paced day and age, you're still all about peace, love, and far out tunes, man!